The difference between a medicine and a poison is dosage. That goes for sunshine, protein, fiber, sleep, work, and nearly anything. Over 100,000 Americans die annually from the on label use of prescription drugs, per JAMA. Yet, there are no deaths from the use of nutrition supplements, even though many are overused and abused. For decades, the medical profession has told us to hide from the sun. We now have epidemic proportions of vitamin D deficiency throughout the world, especially among dark skinned people, who need more sun than fair skinned people. Vitamin D regulates more than 20% of the human genome and has major implications for health and longevity. Vitamin D deficiency has become a global public health problem, as in absence of any noticeable symptoms often people are not aware that they may be lacking this crucial vitamin. It is vital in getting healthier and staying healthy after any illness. Many are at risk and not aware of the Vitamin D deficiency symptoms. However, vitamin D plays many important roles inside your body and reduced levels of this vitamin can cause serious threat to your overall well-being. Most people are not aware of Vitamin D deficiency symptoms. Vitamin D is a fat-soluble vitamin, which is found in two forms i.e. vitamin D2 and D3. Vitamin D2 is known as ergo-calciferol and it comes from fortified foods, plant foods, and supplements while vitamin D3 is known as chole-calciferol and it comes from fortified foods, animal foods (fatty fish, cod liver oil, eggs, and liver), supplements, and also made internally by your skin when exposed to direct sun. That’s why, vitamin D is also known as “sunshine vitamin,” as your body naturally produces all the vitamin D it needs, when exposed to direct sunlight. When, you get short (30 minutes) regular exposures to the sun, your skin makes vitamin D3, which is then transformed to 25-hydroxyvitamin D3 by hydroxylation process in your liver, and then again to its active form 1,25-dihydroxyvitamin D3 in your kidney. However, if you spend a lot of time inside and use sunscreen or cover your skin when you go outside, you don’t get enough sunlight and your lifestyle puts you at risk of vitamin D deficiency. Vitamin D is necessary to get healthier. Also race, age, and other factors increase your risk of vitamin D deficiency. What are the real benefits of nutritional supplements? Melanin, the skin pigment works as a natural sunscreen, so people with a naturally dark skin tone need at least three to five times longer sun exposure to make the same amount of vitamin D as a person with a white skin tone. As people turn 50, skin doesn’t make as much vitamin D and the kidneys also become less productive to convert that vitamin D into its usable form. As vitamin D is fat soluble, higher body fat affects the levels of vitamin D in the blood. As a result overweight or obese people require more daily vitamin D.
Gastrointestinal conditions such as Crohn’s, celiac or inflammatory bowel disease reduce fat absorption and thereby lower absorption of fat-soluble vitamins like vitamin D.
A 2014 study found a link between low blood levels of vitamin D and aggressive prostate cancer in European, American and African American men. Researchers looked at vitamin D levels in 667 men aged 40 to 79 years undergoing prostate biopsies. The connection between vitamin D and prostate cancer was especially strong in African American men. Older men are more prone to prostate cancer with the average age of diagnosis being about 66 years old, according to the American Cancer Society. Prostate Cancer is the most common cancer in men, and the second most common cause of cancer death in American men. People suffering from kidney disease are found to be more susceptible to vitamin D deficiency, as their kidneys are unable to convert vitamin D to its active usable form. The total amount of vitamin D you can produce is also affected by the season, time of day, ozone amount, latitude, and number of clouds in the sky. Therefore, people living further away from the equator are more susceptible to vitamin D deficiency as they get fewer hours of overhead sunlight. Vitamin D is a crucial nutrient for your bone, skin and mental health. Though, the most important role of vitamin D is to absorb and retain calcium and phosphorus, for health and development of your bones and skeletal system. It also helps in reducing inflammation of arteries, clearing plaques and controlling blood pressure, which improves your cardiovascular and brain functions. Further, it regulates the expression of genes that influence your immune system to attack and destroy bacteria and viruses, and plays vital role in controlling infections and reducing cancer cell growth. Tiredness or fatigue: Feeling or tiredness, exhaustion and muscle weakness is a sure sign of vitamin D deficiency. Excessive sweating: Sweating profusely especially on the forehead, in a moderate temperature environment with steady physical activity levels, could be a sign of vitamin D deficiency. Bone and joint pain: Osteopenia, osteoporosis (brittle and fragile bones) and osteomalacia (chronic pain in bones and stiff joints), are signs of vitamin D deficiency. Depression: Diagnosis of depression is often linked to deficiency of vitamin D.
High blood pressure and frequent bout of infections (including colds and the flu) are other important signs that you might be suffering from vitamin D deficiency. Sometimes in severe vitamin D deficiency you may experience difficulty in getting around. If you’re at risk for deficiency or experience any of the above noticeable symptoms consult your physician or have a blood test to examine your vitamin D levels. Vitamin D deficiency is defined as a serum 25-hydroxyvitamin D concentrations ≤20 ng/mL. 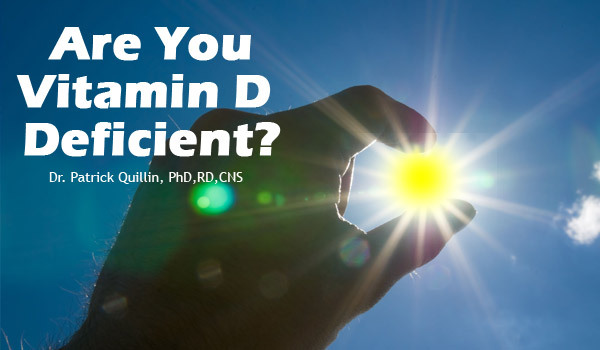 Research suggests that 30 ng/mL to 50 ng/mL of vitamin D is required for optimal health. ImmunoPower has 250% of the recommended daily allowance of Vitamin D.
Standard treatment for a vitamin D deficiency is vitamin D3 supplementation. A daily dose of 800 to 2,000 international units (IU) is suggested for recovery. Also, take your vitamin D supplement with a meal that contains healthy fat for best absorption. Some foods also have vitamin D but level in most foods is too low to correct a deficiency. So, supplementation and exposing your bare skin (arms, legs, abdomen and back) to the sun for 20-30 minutes daily are the two ways to correct deficiency. Are you Magnesium Deficient? Though, the recommended daily allowance (RDA) or average daily intake sufficient to meet the nutrient requirements of vitamin D3 for children and adults under-age 70 is 600 IUs (those over 70 is 800 IUs). Research suggests that rather than aiming for “average” or “normal” range, you should aim for “optimal” range of vitamin D in your body by supplementing 1,000 IUs a day for children and 1,500 to 2,000 IUs a day for adults, for bone health and chronic disease prevention. Vitamin D Deficiency Symptoms, once remedied will contribute significantly to getting healthier? Vitamin D deficiency is rampant since we all moved inside, then were told to hide from the sun. Best food sources of vitamin D include fatty fish (salmon, sardines, etc. ), fortified milk, eggs, liver, and mushrooms that are treated in the sun. Vitamin D actually is more of a hormone than a vitamin, since we can make vitamin D in the skin with the action of sunlight. Vitamin D regulates at least 20% of the human gene, which makes it vital in our quest for health.